Mercy’s Gate is an all-encompassing beacon of hope for many families in northern Colorado Springs facing hard times. On a weekly basis, member churches, volunteers and staff provide a plethora of resources all while tending to their neighbors’ spiritual and emotional health. Today, Mercy’s Gate has a bigger mission than supplying food: churches joining together to love their neighbors by helping with physical financial, emotional and spiritual needs. On a weekly basis, member churches, volunteers and staff provide a plethora of resources all while tending to their neighbors’ spiritual and emotional health. Kay said, “We are a faith-based social service agency. We do rental assistance, utility assistance, clothing vouchers, and have an enormous food pantry. We also have a faith community nurse and help with prescription and medical needs. We offer a little professional counseling, connect people to free legal help and make referrals for other services. As a faith-based organization, we offer prayer for people, too.” Along with weekly human services, the organizations runs seasonal programs, like offering free tax preparation, an Annual Health Fair, a Back to School Program, and both Thanksgiving & Christmas Projects. Meet one of our CharityTracker champion volunteers, Pat Simmons! 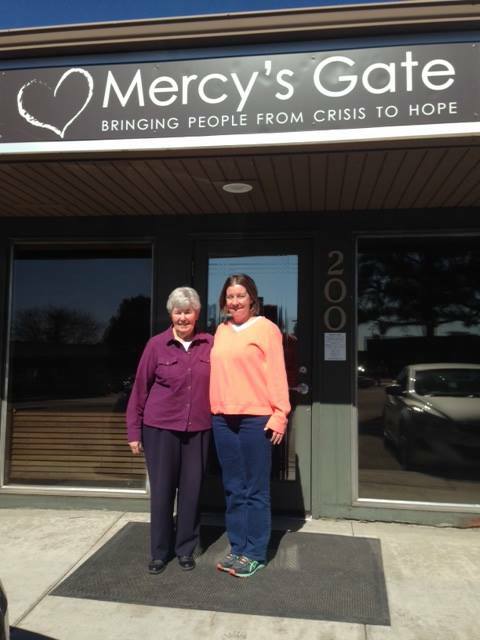 Pat is a Mercy’s Gate volunteer & CharityTracker Administrator extraordinaire! Pictured here with Jenny Kay, Director of Community Programs at Mercy’s Gate northern Colorado Springs center. According to Pat Simmons, faithful volunteer at Mercy’s Gate for over 10 years, there are nearly 100,000 people in the database who have received assistance over the years. And Pat would know, as she is the administrator of Mercy’s Gate CharityTracker database. “We have used CharityTracker since the end of 2010,” said Pat. Prior to that, she was assisting the staff by entering data into an Access program. “I knew basically what I needed to do to get started. I have put in so many names. It’s amazing! The 100,000 includes people of all ages,” she continued. When Mercy’s Gate started using CharityTracker, they migrated all their previous data to the new system. Though the organization does not network their database with others agencies or churches in the community (like other’s profiled in this report), their single agency use has proved very beneficial to the organization. Pat, as well as a few other volunteers, help to run reports of the good work for their neighbors. She runs a report for the organization’s Executive Director every month on the rental assistance program and another volunteer is currently running reports for a large program audit. All this is information in compiled straight from CharityTracker. The reports tell them vital information. “For instance, we now know that most of the people we serve come in for assistance less than three times in their lifetime, 83%, in fact, have been here three times or less,” said Kay.